Bill Moreau, DC, DACBSP, FACSM, is a chiropractic sports medicine physician and evidence based clinician. He has lead sports medicine for the United States Olympic Committee after more than 25 years of private practice. 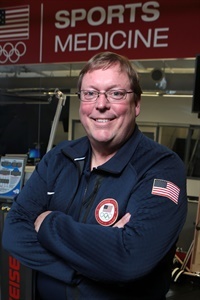 Moreau develops the USOC sports medicine strategy and oversees all Team USA sports medicine activities including; clinics, games and the National Medical Network. Dr. Moreau served as the Medical Director for Team USA at the London 2012 Summer and Sochi 2014 Winter Olympic Games and as the first doctor of chiropractic in the world to serve as an Olympic Games Chief Medical Officer (CMO) at the 2016 Rio Olympic Games. He has managed the care of thousands of athletes. He has been featured in USA Today, Time, ESPN, NPR, NBC, the New York Times, GE Healthcare News, the US Department of Health and Human Services, Army Strategic Studies Group and the Allegany Healthcare Summit. Dr. Moreau has a special interest in sports medicine research centered on the prevention of injury and illness in athletes and concussion. He serves on the NFL International Think Tank on Concussion Research. Moreau has successfully presented over 700 invited lectures throughout the United States and Internationally.